I was making the turkey and date meatballs again and wanted to try something different on the side besides cinnamon-garlic lentils (besides, I was running low on lentils). But I didn’t want to go to the market, so I needed a pantry side. And then I remembered Mujadara. A dish I’ve become acquainted with in Israel, it’s often translated as “rice, lentil, and caramelized onion pilaf.” Also spelled moujadara, mejadara, mujaddara and megadarra, it’s a delicious, homey recipe common throughout the Middle East (it pops up in Lebanon, Syria, Jordan, Saudi Arabia, and, of course, Israel). If you share a love for healthy food and cooking then an online nutrition degree might be a great choice. The more we learn about health, the more we can make delicious things like this that are also good for us. Caramelizing the onions takes a bit of time, but other than that it’s an easy peasy recipe that transforms humble pantry staples into a hearty side or even a vegetarian main. Anything based on caramelized onions is good in my book, and here it provides the flavor base for an otherwise unassuming combination of onions, rice, and lentils. Warm spices add another layer of complexity and, well, warmth. And Mujudara is great any time of year; it’s substantial enough for a cold winter’s day and yet not too heavy to be enjoyed in the midst of summer’s heat. The garlic-lemon yogurt sauce is not necessarily a traditional accompaniment, but it adds just the right creamy tang and definitely makes it a viable main. The Mujudara and yogurt were perfect alongside the turkey-date meatballs, but would also go well with any number of items from grilled chicken to roasted vegetables. While it’s best to prepare the lentils and rice separately, I was lazy and cooked them together (with only two working burners preparing them separately just takes up too much valuable stove top real estate). I was also a little short on lentils so only used ½ cup, but you can use up to 1½ and up the rice to 2 cups. There are many variations of Mujudara and this particular recipe is adapted from the incredible blog Herbivoracious, which is chock full of tantalizing vegetarian recipes and stunning photos to boot. If you haven’t checked it out before go now! Melt the butter along with the oil and 1 teaspoon salt in a larg skillet, and add the onions. Set heat on medium-high and stir occasionally until soft and very brown, about 30 minutes. De-glaze pan with white wine or vermouth (or water) and stir into the onions to get more flavor. Meanwhile, combine the rice, lentils and cinnamon stick in a pot. Cover with 2 inches of water and bring to a boil. Reduce the heat and simmer over moderately low heat until the lentils are tender, about 25 minutes. Drain the lentils and transfer to a bowl; pick out and discard the cinnamon stick. When everything is cooked combine the rice, lentils, spices, half of the onions, and more salt and pepper together in a large bowl. Taste and adjust seasonings. 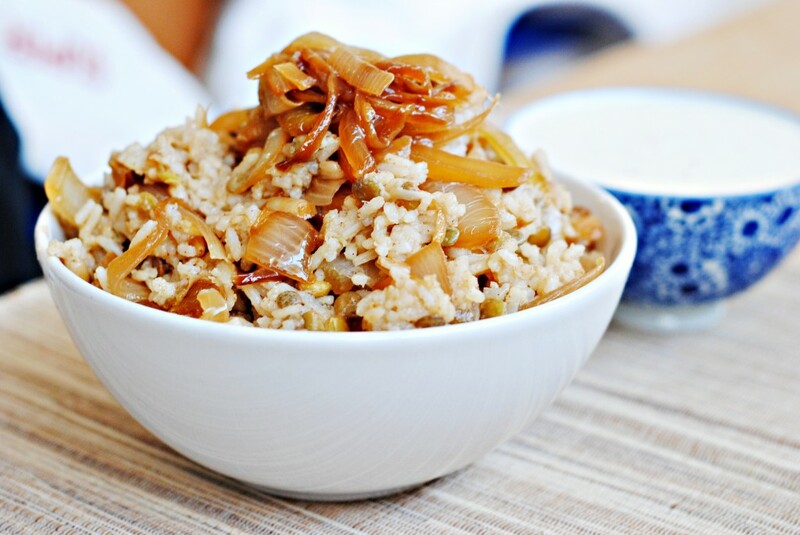 To serve, form a large mound of rice and top with the remaining caramelized onions. Pass a bowl of garlic-lemon yogurt (recipe below) to mix in as desired. It is excellent hot and at room temperature, and just gets better after a day in the refrigerator. Combine the yogurt, garlic, lemon juice, and dried coriander in a bowl and stir to mix thoroughly. Serve immediately or cover and refrigerate until ready to use. won’t the lemon curdle the yogurt? is there a way to prevent this from happening? Excellent question! The yogurt did not curdle at all, and I’ve added lemon to yogurt before with similar effect. I think it may curdle when it’s warm, but when cold or even room temp it is fine. Lemon juice curdles milk, but maybe the yogurt is thick enough that it prevents it from happening? If anyone else wants to chime in I’d love to hear other ideas! Thank you for reminding me — I still need to make your turkey date meatballs and cinnamon garlic lentils. It’s been on my list for a while, but all these pesky moves, rental units, so on and so forth… Ha. I made mujaddara several months ago and fell in love immediately. Since then I’ve made it quite a few times, often pairing it with chickpeas slow-simmered with tomatoes, eggplant, mustard seeds and some favorite Indian spices. Quite a tasty combination, though plain with a warm naan is perfect. Per Steph’s question: I’ve never had a problem adding any citrus juice to yogurt, regardless of its temperature or fat content. All that results is a delicious flavor kick! Yum – it sounds amazing with the chickpeas, tomatoes, eggplant, etc. And thanks for your input on the yogurt/lemon question! I’ve never had a problem either. Actually, the way I learned to make majadera involves only one pot, with the onions, rice and lentils added in stages. So your version isn’t actually lazy! Amazing! I love learning that I’m not actually lazy… The main purpose of cooking the rice and lentils separately is to have greater control over the texture of both, but I was happy with the result I got. OMG this looks so good! I didn’t think it could get better after reading about the turkey date meatballs but this side makes me sit up and take notice. I would love to make something that looks this delicious! I make mujadara all the time, usually accompanied by hard boiled eggs and greek yogurt. The garlic lemon yogurt is an intriguing idea. Bookmarking this to try soon. Ooh love the addition of hard boiled eggs. This dish is so versatile! Hope you enjoy it with the garlic-lemon yogurt too. Nice! We often have some kind of yogurt or tahini based sauce with mujadara as well, so I’m totally on board with your combination. Tahini would be a great addition, good idea. Thanks as always for another great recipe! I made mujadara last week, and it is my post for this coming week. When I post, I’ll link yours for the variations. Looks very very delicious but I haven’t tried majadera before. Next time I have a chance to eat it I must try this and I’ll remember it from this post! Wow, that looks absolutely delicious. Those onions really do make the dish, don’t they? That looks like a great variation of the “rice-and-lentils” theme. Just one question though: do you really use “3 pounds” onions in this dish or is that a typo. It just seems a lot for the amount of rice and number of servings given. Thanks! I know it seems crazy, but yes, I used a whopping 3 pounds of onions. Once you allow them to caramelize they really cook down a lot. Also, this makes a really big serving of mujadara. I just recently made this and, bravo, Katherine. So, so tasty.